The previous article outlined the fundamental problems facing traditional matrix organizations in an environment of fast-moving, innovative markets. Becoming a “T-Rex company” certainly sounds like a great idea these days. But what does that actually mean? How is it actually done? The answer involves two preconditions and a carefully scripted implementation plan. The following preliminary steps are necessary to kick off the transition process of becoming a T-Rex company. Precondition 1: Bet on projects. In systems development, serious risks must be taken and — what’s equally important — properly contained. This requires the use of a tried and true approach to organizational productivity that results in real, substantial progress. Instead of developing exotic strategies and multi-dimensional matrix layers to create what is likely to become merely the illusion of risk-oriented, modern enterprise, companies must use a concept that was created and established long ago as the best way to cope with risky endeavors. Specifically, they must use projects. Bet on projects. Do so boldly. And a stout boldness you will certainly need. In transforming your organization from a lumbering Diplodocus to a fast and fierce T-Rex, you will have no choice but to challenge many complacent structures, and this will not happen without painful sacrifice. But although you may feel at times that you’re faced with the impossible, you will find that you’re actually able to make enormous progress if you adopt a bottom-up approach up instead of the top-down strategy that some managers are tempted to practice. By this I mean that the transition toward a projectized organization is much easier if you create a personal outlook for individual employees that is aligned with the T-Rex company goals. In other words, you must define new career paths — and this is the second precondition. Precondition 2: Create technical career paths. Following the money is always the easiest and most effective way to understand the dynamics of a commercial organization. We have all heard the claim, which is disseminated by various career experts, publications, media outlets, and rumor mills, that people generally value interesting work more than high wages. But while there is a grain of truth in this, since it is indeed important for workers to have fun and find some sort of personal fulfillment in their jobs, the practical reality is that it’s even more important for people to earn more money as their skills and qualifications increase. In a traditional organization, earning more means giving up technical work for a line management position. I have seen countless brilliant engineers who were given management jobs because their bosses wanted to prevent them from looking for better-paid positions. The result has almost always been a financially well-off but emotionally unhappy and professionally frustrated manager who does not get to enjoy practicing his technical skills anymore. Instead, he now finds himself obligated to struggle with all of the challenges that come with any management position, including, especially, the challenges of politics and personnel. It is hard to see the benefit of such strategy, but this doesn’t prevent it from being widely used. There is no room for such a blunder in a T-Rex company. In the new high-tech business environment, it is crucially important to create a career environment in which being promoted does not mean giving up technical work. A new and expanded conception of types of work as matched to levels of pay must be developed. Companies have to make it possible for employees to follow long-term technical careers and become top-level experts in their fields while earning pay comparable to what they would earn if they were senior managers in a traditional matrix organization. At the highest level on this ladder, the Chief Software Architect would receive the same salary as a VP manager. Similar career ladders can be created for configuration managers, test engineers, graphics experts, algorithm developers, and so on. With this obvious but dramatic change to the customary way of doing things, experts can continue working in their beloved technical areas while enjoying the equal respect and income of a line manager job, minus the ugly strings attached to management positions for which they are poorly suited. It is easy to see what a boon to productivity this type of system could be within any organization. Once the above-described preconditions are met, an organization is ready to begin its transformation in earnest. Fortunately, the actual implementation is not as difficult as it may at first sound. There is a simple way to implement the “T-Rex” pattern. I will not go into the details of a typical organizational change process, as this is well described elsewhere. However, the following organizational measures must be implemented. The presence of a pool of experts is a pivotal feature of a T-Rex organization that ensures its structure will be both sustainable and efficient. Instead of distributing specialists among various and often redundant departments, the T-Rex organization creates a centralized set of technically oriented groups of experts. Each group has a hierarchy in the form of an expert career path as discussed above. During “pool time,” members of each group have the opportunity to attend training, learn new skills, publish technical articles, develop product ideas, and exchange ideas with their peers. At the top of every technical group, a “guru” expert is established who only sporadically works on projects. Instead, guru experts work on new technologies, train their group members, take care of new technical trends, attend conferences and symposiums. They are public persons: exposed to the expert community outside the company, spreading the word about their employer, and attracting potential new employees to join the company. These experts only serve as active members of their respective pools during the times when they do not have any project assignments. The moment they tackle a project role, they put their memberships on hold, that is, they do not report in any way to their pool superiors until they return from their project assignments. This is another significant difference from a matrix organization, where line management superiors always retain a higher priority than project managers or any other matrix dimension. In a T-Rex company, experts are completely committed to their project managers during project times. There is no other authority that could spontaneously reassign staff members, as often happens in a matrix organization. When not in a pool, the expert is a fully committed project member. To perform to their best ability, experts need the right environment. The following aspects of the workplace must be taken into account. Office space. Modern offices tend to be big open spaces full of desks and cubicles, and while this may work well for a call center, technology experts who spent a lot of time working in their heads need quiet, private locations. Every interruption — a ringing, a colleague passing by on the way to the coffee machine, a too-loud discussion in the next cubicle — creates an enormous waste of time and money by assaulting the tech expert’s private thought process. Thus, the best office space consists of separate rooms containing up to five people who get along well with each other. Another way to create a quiet workplace is to offer remote work (VPN) for several days each week so that “real work,” as many experts call it, may be done in the peace and quiet of a home office. Network and devices. It is a mystery to me that a top-notch expert working on a cutting-edge product could be expected to succeed while working on a six-year-old workstation with an outdated operating system, and while staring at a single, ancient display and accessing the project data via narrow bandwidth. But this is often the case. Employers who practice this kind of “austerity” send out a horrible message to their teams. In a high-tech project, the exact opposite mindset is required. Good IT infrastructure is essential for an expert team’s morale. Tools. Analogously, the specialized tools used for development must be up-to-date. A high-tech project being developed by top-notch expert can manifestly not succeed running solely on Word and Excel. Current CAD systems, CASE tools, specialized hardware devices (e.g. automotive CAN tools), compilers, code versioning systems, workflow tools, project management tools, quality assurance tools, and other such tools all need to be accessible to every project member. That also means a sufficient number licenses must be available. With all of this said, it is important to recognize that not everything is a project, and certain project-independent structures must exist outside the pool-project parity to provide operational and strategic aid to the projectized part of the organization. In an organization that creates its own products, the program and product management structure will serve as the connection between the strategic core team and the projects. In an organization that is a make-to-order development services provider, the sales team will serve this purpose. In most cases, a mixture of both will be required. The following picture shows a simplified overview of an expert pool-based, projectized organization. Identifying top-performers. Project managers are solely responsible for staffing their projects. Thus, they will look for the best of the best in the Experts Pool, because they know that in project businesses, quality always beats quantity. Consequently, the Experts Pool will progressively expose a sediment of weakly performing experts and give management a good assessment of who should be asked to leave when the next economic downturns arrives. Limiting the headcount growth. Since project managers are fully responsible for delivering results according to their budgets, they will not strive for a higher “headcount,” as it is often the case in matrix organizations. They will try to keep their teams small, as it is a well-known rule of project management that large teams tend to be inefficient and expensive. Because of this, the organization will reduce the Parkinson’s Law effect of senselessly growing organizations. Attracting talent. Since experts in these companies are paid well for their expertise, these companies will automatically attract talented new employees. Elevating leadership. Leadership is a holy grail of modern business management, and in a T-Rex company, it comes naturally. The dilemma of typical matrix managers, who are required to maintain a decent “management by objectives,” that is, to set goals for their directs and then verify their fulfillment, is virtually non-existent in a T-Rex organization. Since projects are by-definition driven by goals, nothing else but those goals will count to the experts. An organization in this mold is a truly fierce and wondrous beast: market- and performance-oriented, nimble, fast-reacting to market changes, talent-attracting. It delivers a work environment that is both challenging and enjoyable to the employees. It will go for a kill every time when a new product opportunity arises that gives its experts a chance to show the quality of their intellectual craftsmanship, of which they are rightly so proud. This type of company is a predator that will hunt down and destroy its competition before they know what hit them. It is a T-Rex company that will accept risks because it is hungry for the rewards that go with them. Obviously, I hold the T-Rex model in very high regard. In fact, I consider it to be the central model for success in the current and future business tech environment. 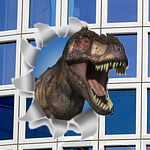 But this doesn’t mean that I’m saying every commercial organization can or should become a T-Rex. Sometimes, for some companies, it simply doesn’t make any sense to be risk-oriented, nimble, and cutting-edge. These types of organizations function perfectly well according to the old matrix model, and any attempt to transform them into T-Rex companies can do a lot of harm. Discernment is required here, as in everything. I have personally seen T-Rex companies in action. One of them, a huge division of a global player (which I cannot name here for legal reasons) that provides worldwide project services, has been a T-Rex for decades, and its performance has been positively devastating to the competition. It is an incredible cash cow for the corporation. Many times in my own professional past I have been a member of its project teams, and each of these experiences has been a challenge and a source of a professional joy. Having to work day and night on extremely difficult project tasks didn’t bother me, because I felt profoundly excited to be part of a T-Rex company. Here’s the simple test for deciding whether the T-Rex model is for you: if your company develops and sells complex systems or acquires projects in such an environment, then you should become a T-Rex organization. There is absolutely no reason why the model shouldn’t work for you and your team, who will thank you for improving all of your situations. Being part of a T-Rex organization reshapes the mindsets of all team members. Just think of it: your experts did not go through many years of difficult technical education just to become bureaucrats. They desire work in their respective areas of expertise because they are passionate about their knowledge domains. In a T-Rex company, they are automatically permitted to do what they love while receiving attractive wages. Few things motivate more strongly than doing what you love and being paid for it well. With such highly motivated team, your company will become an unstoppable, terrific T-Rex giant of its industry: feeding on slow-moving Diplodocuses just like the one your own company used to be, moving swiftly from one target to the next, and growing and thriving in ways and on levels that never seemed possible before.